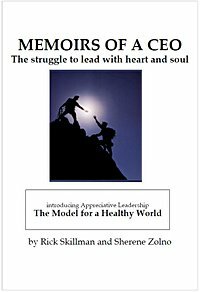 Memoirs of a CEO: Leading with Heart and Soul, by Richard Skillman and Sherene Zolno. "No one knows what it is like to sit in the CEO chair until you actually do it. And then you’re faced with making a decision that will have widespread and longterm ramifications, in many cases affecting the lives of thousands of people. In spite of the cost, you must put your heart into it." ORDERS NOW BEING ACCEPTED for this newly released eBook. No shipping costs for this book as it will be delivered via email within 48 - 72 hours of purchase. To place your order please contact us.